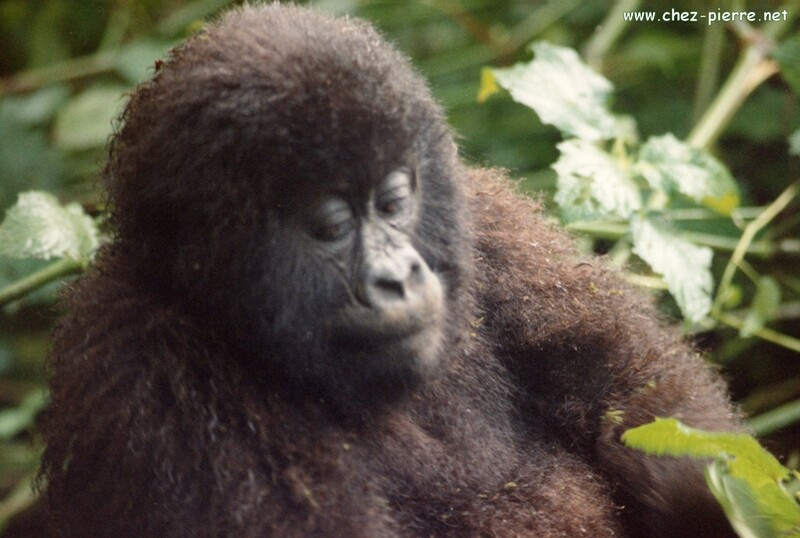 You have (re)discovered the moutain gorilla thanks to the superb movie "Gorillas in the mist" with Sigourney Weaver playing the role of Dian Fossey. 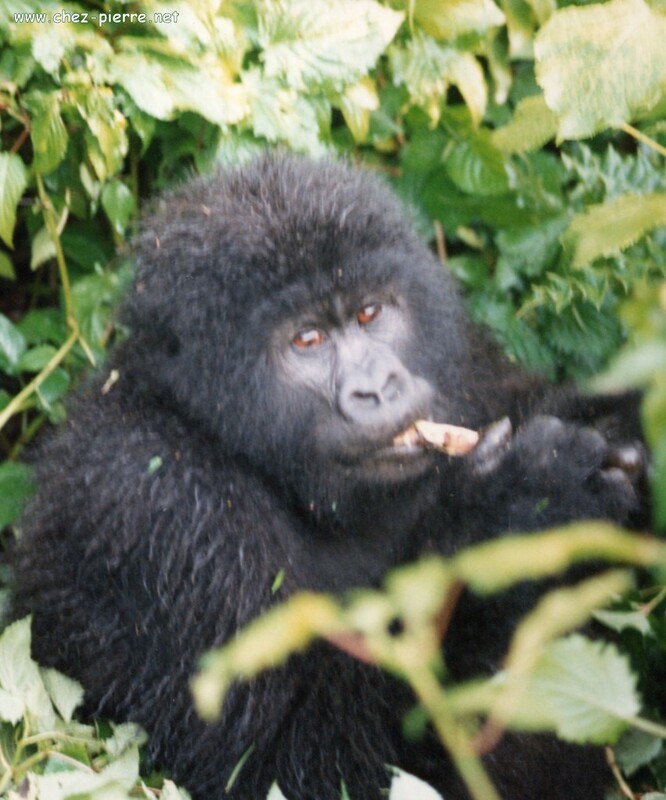 This extraordinary woman lived almost 18 years with the gorillas in this small tropical jungle area, on the Rwanda side of the mountain bording Zaire and Uganda. Through her work and the support she received, she created there the Karisoke Research Center. It's also there she was murdered on December 26 1985, hit 6 times with a machette on the head, maybe by poachers against whom she was openly fighting. She has been buried in Karisoke, near the gorillas cemetary. This famous primatologist left us exceptional documents, killed the wrongful image of "King Kong" monsters and inspired the protection efforts towards this animal who probably is our closest cousin. 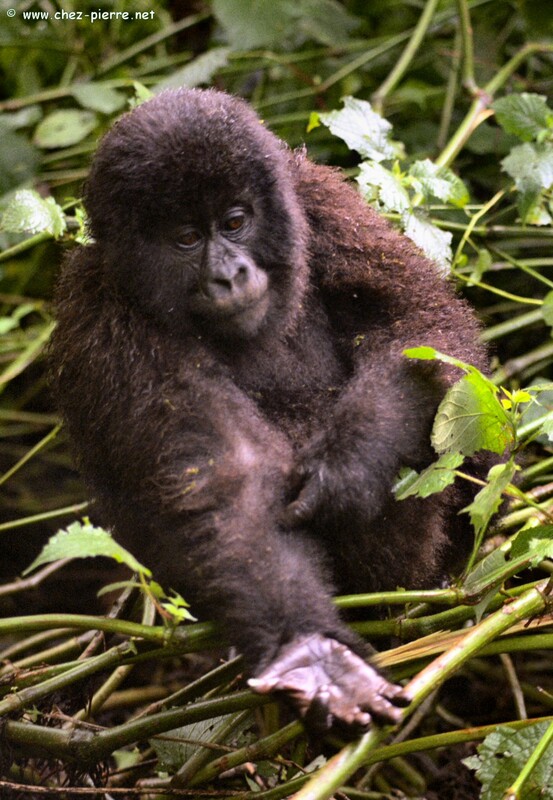 The Dian Fossey Foundation continues her efforts for the protection of the gorillas, you can even adopt one ! Sigourney Weaver is its Honorary President. Click here to visit their site. 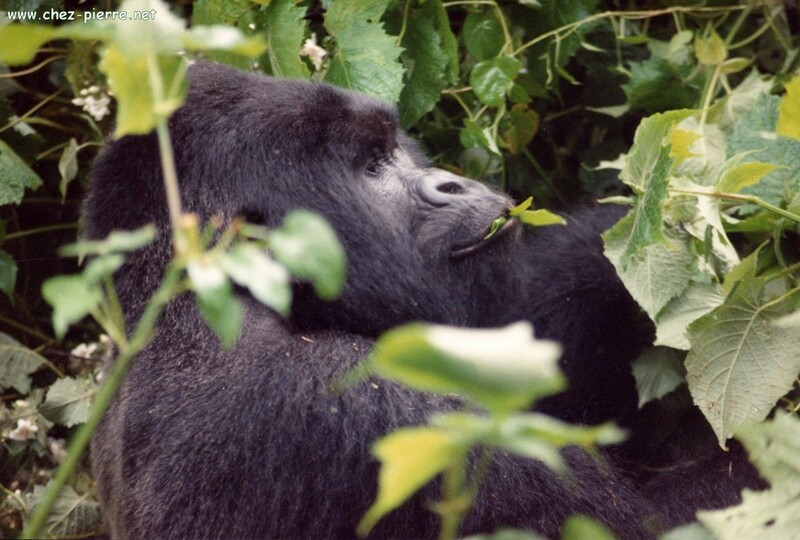 In 1989, about 600 mountain gorillas were counted in the area, including about 325 on the Zaire side where I was. They were about half that number in 1980, which proves that the protection programs were working well. 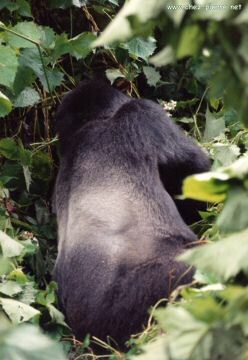 There are much more plain gorillas (about 50 000) and these are the only ones you can see in the zoos. 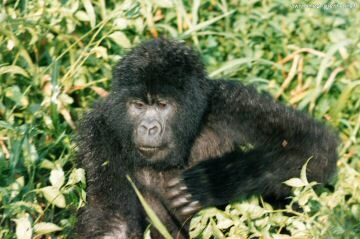 Mountain gorillas live in groups of 5 to 30 individuals, lead by a dominant male who is its absolute leader. He can reach 2 meters high and weigh more than 250 kg. The dominant male and the other males older than 11 or 12 (their life expectancy is 20 to 40 years) are easily recognizable by their "Silver back". Very powerful, the gorilla is not agressive though, if he is respected. Even from the backside, he's dominant ! He's polygamous and his family can be huge ! Females can have 5 or 6 babies, about one every 4 years. They are smaller than the males by about 30 centimeters, and their social status depends on the order they joined the family. Yes, I did say "social status", because gorillas do have a real social life and real feelings, like Dian Fossey described : gorillas are not dumb ! In the evening, each one makes a nest with branches and leaves, even the young ones. They have to make a new nest every day since they move a lot. 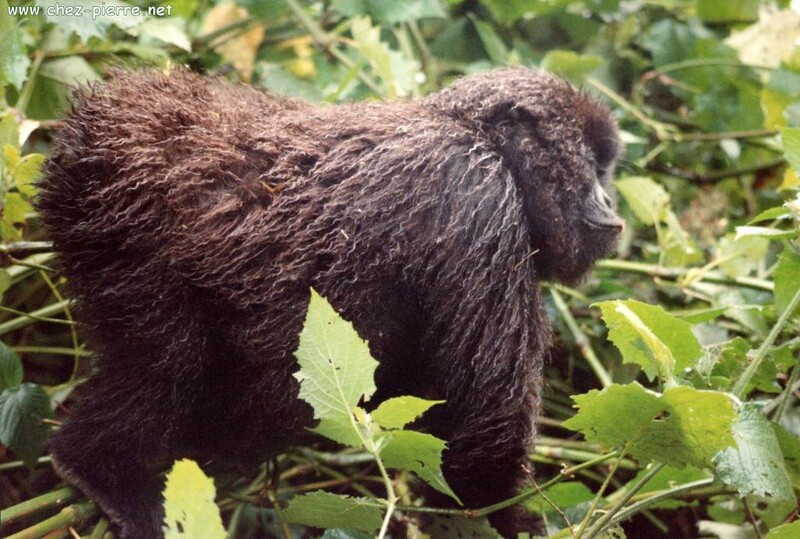 Unfortunately, I can't avoid the subject, the exodus of the Rwandan refugees after 1994 was a disaster for the gorillas too. Four Silverbacks, including Rugabo (this page pictures) Salama and Luwawa were murdered. The word is right, since their bodies were found with a bullet in the heart ! Their bodies were untouched, but the head of another dominant male (Mahehe ?) was found in 1995 at the market, sold by a poacher for a few dozen dollars ! 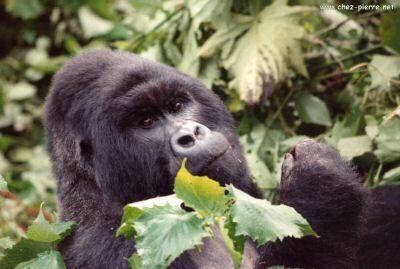 And it's not just about them : scientific observations show that upon the dominant male death, if another male cannot hold the group together and insure its safety, the group splits and the gorillas join other families. Sometimes the young ones are killed by the new dominant male to push the females to insure his own descent. How many of the gorillas presented here are still alive ? This page could almost serve the purpose of a memorial. were also murdered with machettes (1999 ?) ! In 1991, we were absolutely not thinking all that would come. 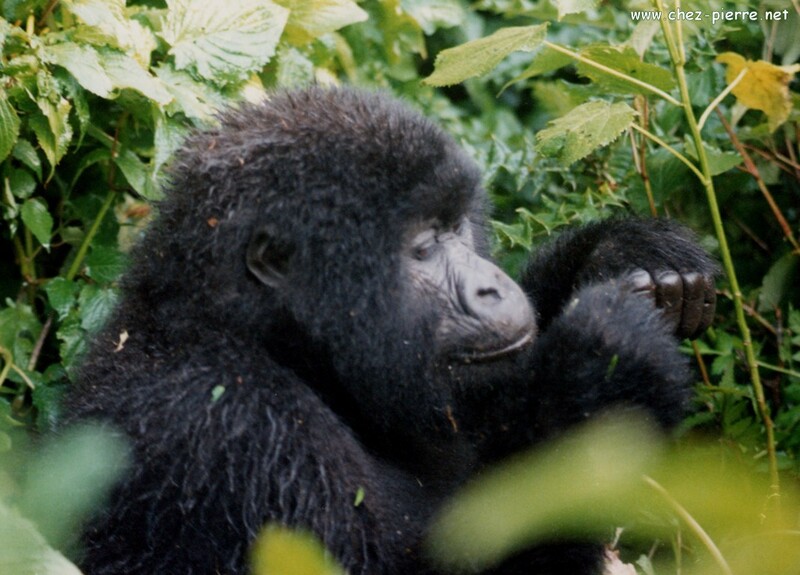 Only counted the souvenir of Dian Fossey, who still had some friends in Goma, and the perpective of meeting, face to face in the nature, the famous gorillas. We actually needed that motivation to face the difficulties on the path to visit them ! 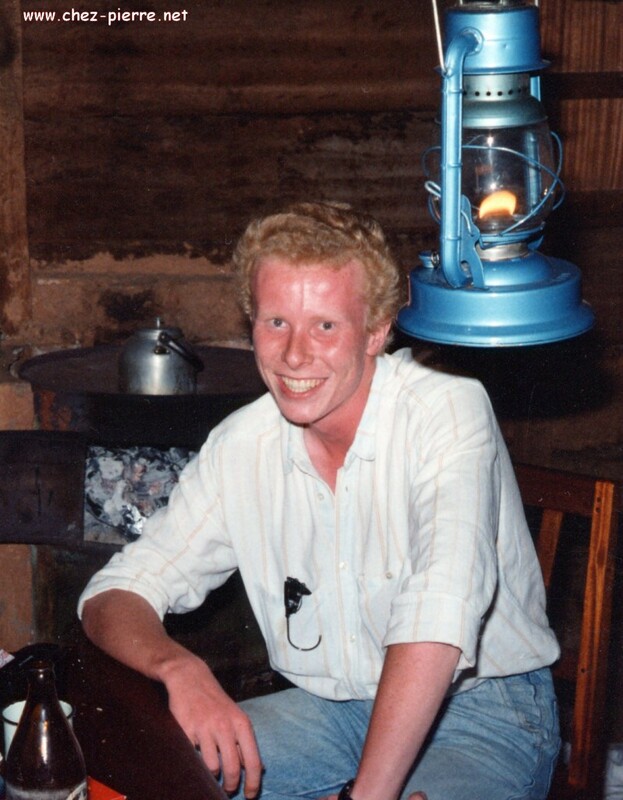 I went to visit the gorillas three times in 1991. When I went there for the second time, it was with my mother and I didn't know if she would enjoy it : the first time, we had to walk almost three hours in the tropical forest, in the mountains, opening a path with the machettes, it was really exhausting. Until Rutshuru, you know what I told you in the previous pages : bad track, but even a truck can pass if the driver is careful. 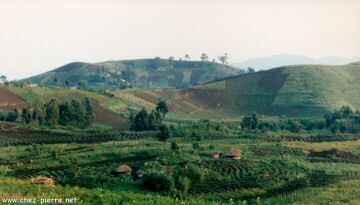 In Rutshuru, we must turn and take another track towards the mountains. That's where everything gets complicated. 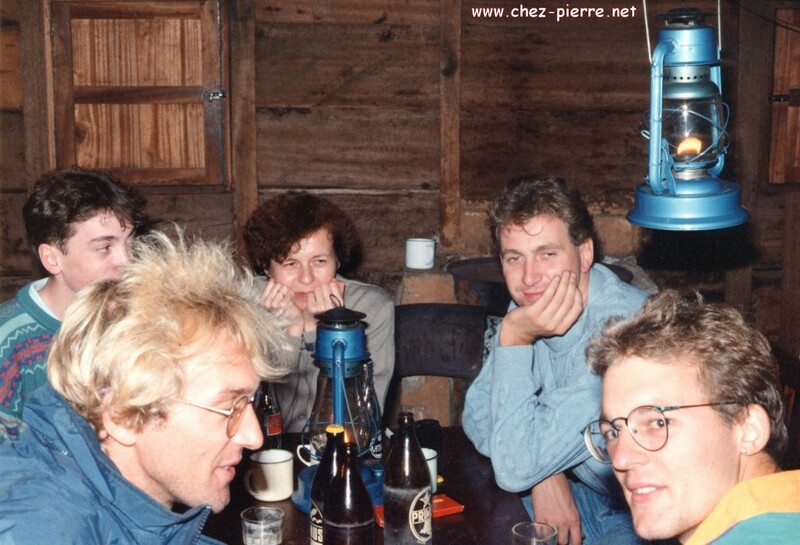 But first, let's be farseeing : in Djomba, there's a wood lodging, but no hotel nor restaurant. So let's stop in the market : bananas, some vegetables, and two chicken. Let's attach their legs (hey, they're alive of course) and put them in the back of the Jeep. Back on the track : only 27 km to go, it shouldn't be too long, and it's only the beginning of the afternoon. All this with two chicken who desesperatly complain in our achy backs ! That day, we were supposed to be about 20 people to go to Djomba, in seven vehicles. Only three vehicles got there (the others broke down or gave up) : me and mom in my Jeep Willys (even more adored since that day), an expatriate from Kinshasa and his son in...a VW minibus (nobody ever understood how they passed, nor how/if they went back), and three Swiss. These left Switzerland to join the Cape with their Land Rover, and on this "little tiny bit of a track" they broke the "joint de culasse" (?) and several shock absorbers ! When at the bottom of the last hill, we have to leave the Jeep and climb on foot. Fortunately, there's a bunch of M'totos who will help carry the bags, the food and the cooler, since we cannot leave anything in the Jeep but the Jerrycans which are well padlocked. What a climb ! On this picture you can see my face right after. We settle in the shared bedroom, give the chicken and the vegetables to a M'toto who will cook our meal. The night is here already, and we musn't go to bed too late : departure at 6 AM tomorrow with the guards to go look for the gorillas, who could be really far away. But that's no reason not to have fun either. of one of the three Swiss ! Wow, what an evening ! But already we have to go, because we don't know how long we'll have to walk to find a gorillas family yet : they can walk more than 10 kilometers every day. A long march with the machettes in the jungle ? 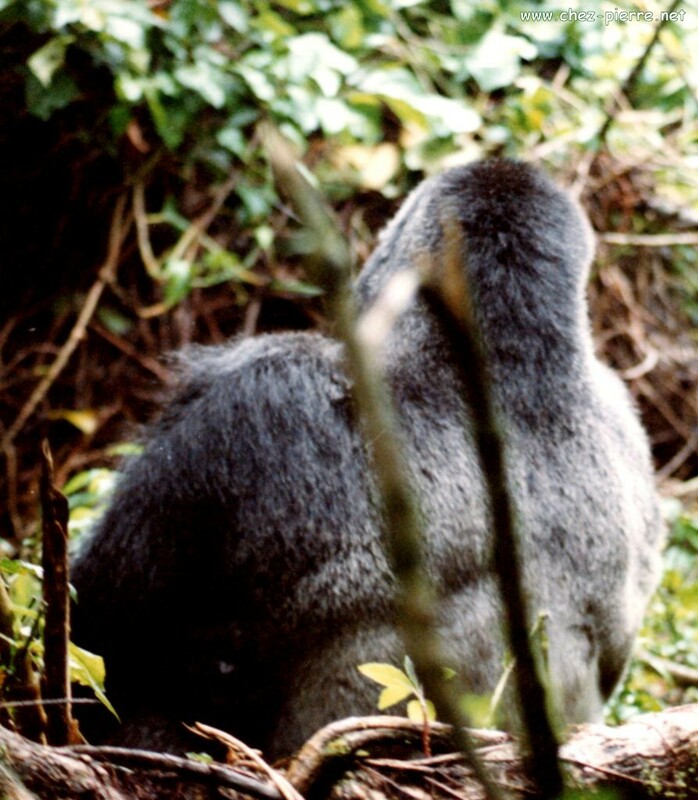 (1) A gorilla bangs on his chest to show his worry and to impress. (2) When a gorilla attacks, he does not punch his victim's chest. He does not bite him either. He charges, and if the "victim" doesn't move, he stops, right on time. I did experience it, and it's inexpressible. He can stop a few centimeters from your nose ! If on the contrary the "victim" flees or is agressive, the gorilla catches him by an arm or leg and runs, draging him in the woods, which does have almost the same result. Rule #3 : to avoid (1) and (2) we have to show submission. 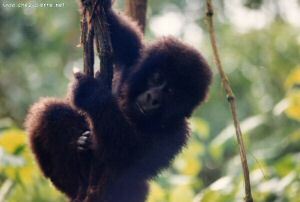 In no time, we are in the middle of the gorillas family. We have to sit down or lay on the ground, not looking the gorillas in the eyes with insistance ; and if one of the males comes, we have to bow our head. Well, simple... Some tourists can't seem to be able to respect these rules. Of course I have to say that when 250 kg gorilla comes to pat your shoulder or delouse your hair, it can be difficult to stay perfectly relaxed. But let's repeat it : the gorilla is not agressive and rarely uses his strength to fight. He'll do it only to defend himself or his family. He'll not even use it to defend a territory : when two families meet, most of the time they avoid direct contact of pretend to ignore each others ! The guards are armed, but to my knowledge they never had to use their rifles except against poachers. A incident with a tourist would actually be very difficult to handle for them : at the same time they have to protect the gorillas which are very rare, and the tourists who finance this protection by paying for the visit ! looking at me in the eyes ! - When there's no tourist, they still have to go visit the gorillas, not only to know where they are, but also to keep them used to have visits. 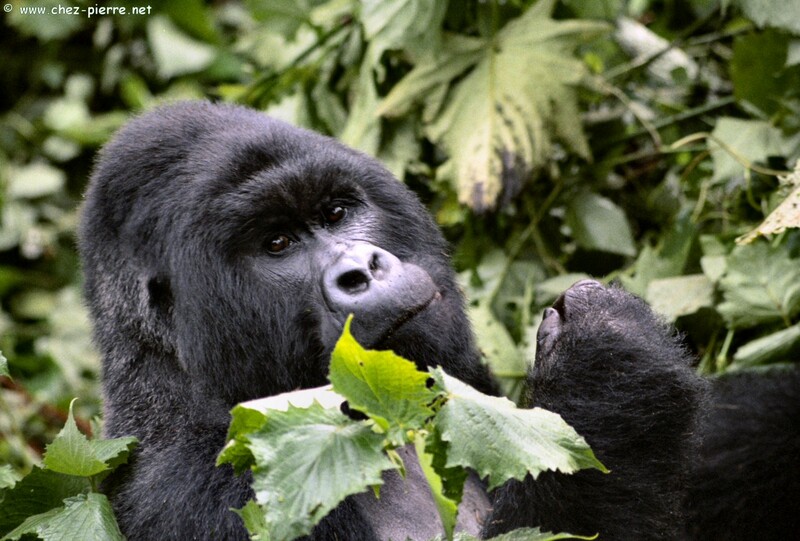 That's how, while living freely in these totally wild forests, the Kivu gorillas do not dislike receiving guests. The tourist to whom I gave my camera missed the picture, but I even had a young gorilla in my arms, delousing my hair, under Rugabo's kind look ! Another time it was Rugabo himself, passing in front of me, who stopped to grab and feel my shirt, probably thinking "Funny fur on you !" Again, no picture of this event : you would just have seen his black hair in a closeup ! 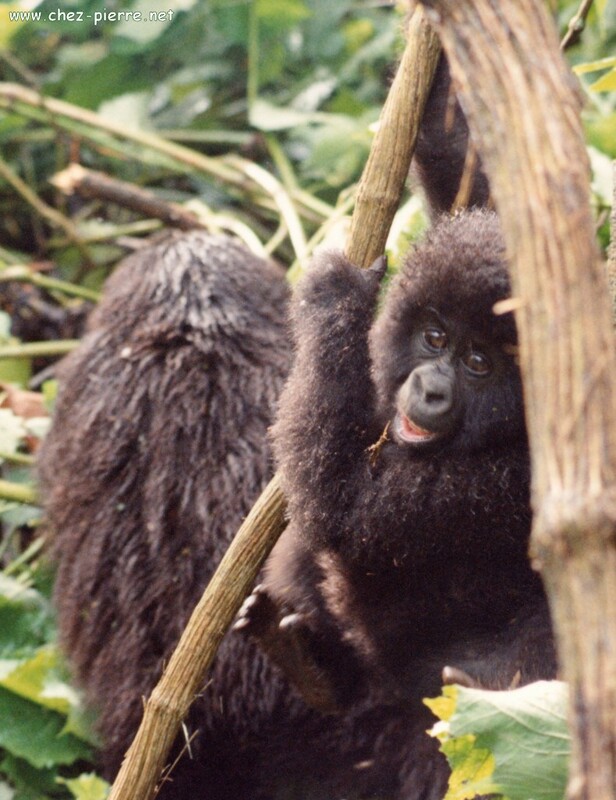 Of course we have to be very careful, especially with the babies and young gorillas who are curious and often rash. They easily come to "play" with you, but they are closely watched by the adults : so you have to let them do without participating in their joy of pulling your hair, pinch you, search your pockets... Not easy but fun ! Rugabo, free, alive, happy in 1991. That said, they are not violent nor "brutal", they'll not jump on you, and they are not thieves like the baboons. After all, when you have the power with you, no need to show it off, right ? And better spare it for the real occasions. The gorillas need help ! And ya don't forget the guide, please ! These three visits were the strongest experiences in my life. (you can even adopt a gorilla !) with also a kids' section with games ! Shows that the genocide did not harm humans only.